Recent studies suggest that the incidence of genetic causes related to male infertility are increasing. In addition to the genes on the Y chromosome, there is evidence for genes on autosomal chromosomes that are implicated in spermatogenesis. Hereditary hemochromatosis (HH) is characterized by iron overload leading to hepatic cirrhosis, diabetes mellitus, hypogonadism, arthropathy and cardiomyopathy, if untreated. The hemochromatosis (HFE) gene is located at 6p21.3. 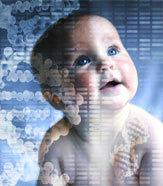 Several studies suggest that a gene (or genes) is required for normal spermato­genesis on the short arm of chromosome 6. To determine the frequency of HFE mutations among infertile/subfertile patients, we studied 205 infertile/subfertile men and a control group of 145 proven fathers by polymerase chain reaction/restriction fragment length polymorphism (PCR/ RFLP) analysis for the presence of HFE C282Y and H63D mutations. No C282Y mutation was found in either group. The frequency of the H63D mutation was similar for infertile/subfertile males (13.7%) and fertile controls (12.4%). The frequency of the H63D allele among patients with sperm counts of £1.0 x 106/mL was 23.5% and was significantly different from the controls (p = 0.019). These results suggest a possible association of HFE H63D allele with severe oligozoospermia.